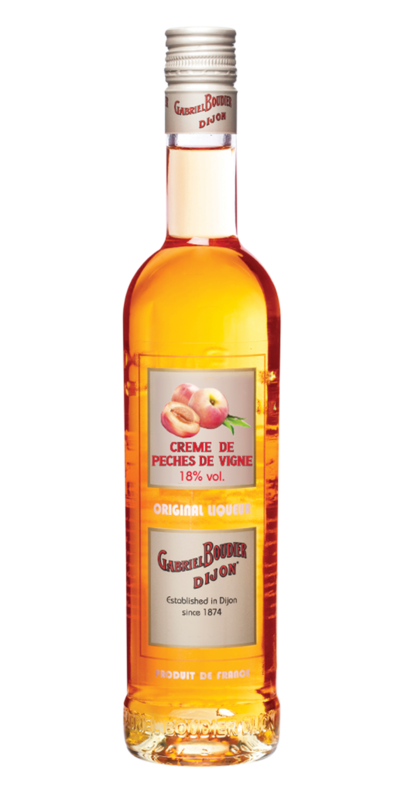 Gabriel Boudier Bartender Creme De Peches De Vigne Liqueur | Bartender Liqueurs | Peach Liqueur — Emporia Brands Ltd. Knowledge and expertise of more than 140 years is at the heart of the House of Gabriel Boudier. A name that is now renowned worldwide. Since its foundation in 1874, Gabriel Boudier has invented and diversified into a range of exceptional products that delight enthusiasts of crème de fruits as well as liqueurs. Gabriel Boudier is now synonymous with authentic tastes which we invite you to discover, enjoy and share with us. The Gabriel Boudier Bartender range is par excellence for times of celebration and fun. The name denotes a trend-setter or aficionado, the Bartender range leads the way and keeps you company at sociable and relaxing occasions. Gabriel Boudier Crème de Pêches de Vigne is a vine peach liqueur which is intimately associated with winemaking in Burgundy. It derives from a small, highly aromatic, puplish-white peach planed along paths leading to the vineyards. This liqueur is the result of macerating and distill- ing these vine peaches in the finest brandy followed by a small addition of sugar.